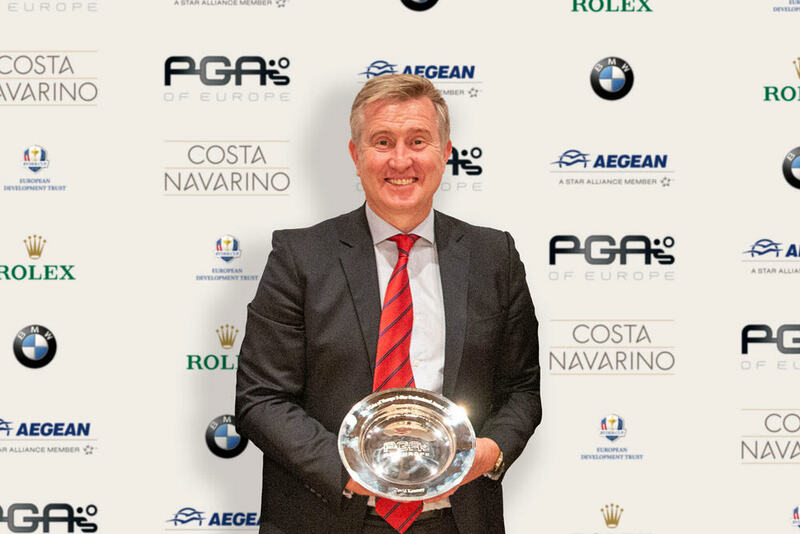 David Kearney has joined an esteemed line of PGA Professionals to have won the PGAs of Europe 5-Star Professional Award in recognition of his work in various areas of golf. Kearney’s impact on all levels of golfers, both as sportspeople and as individuals, across many different facets of the sport make him a fantastic example of a 5-Star Professional that has shown the highest standards and achievements in his areas of expertise and the activities he has undertaken. Kearney began his golfing career at Claremorris Golf Club in County Mayo on the west coast of Ireland, before moving to the world-famous host of many professional and amateur tournaments, The Royal County Down Golf Club, where he began his PGA apprenticeship under Whitson. After qualifying as a PGA Professional, he moved to the United States and The Richmond Country Club near San Francisco Bay and the Golden Gate Bridge, where he was able to learn from two renowned teachers in Dr Jim Suttie and Mark Evershed. Suttie’s own clients of Paul Azinger and Loren Roberts exposed Kearney to the highest levels of the game, whilst one of Canada’s greatest teachers and thinkers in golf, Evershed, was able to mentor him, leading the Irishman to move to Toronto, Canada, to study under him. His globetrotting continued as he moved on The National Golf Club of Turkey for two years where he worked with local players of all abilities, often in using non-verbal communication to coach when language proved to be a barrier. He was able to work with local children and local Professionals to help develop many players, some of which are now fully qualified PGA Professionals themselves. He would later work again with Turkey as National Coach for the Turkish Golf Federation, training and preparing teams for international tournaments such as the Eisenhower and Espirito Santo Trophies in 2008. Moving back to Ireland, he opened his own academy and developed his own teaching system that pulled from his experiences and focused on all-round player development, where he also had success with local teams and players with his various activities with junior programmes, as well as with disability golf. His early experience of working with emerging golf nations no doubt led to Kearney’s interest in both golf and human development, and this has been shown by various activities he has become involved in, including being a prominent member of the PGAs of Europe’s own Golf Development Team, visiting countries such as Panama, Brazil, India, Bulgaria and Hungary, and as a Swing and Golf Coaching Tutor for the PGA of GB&I at the National Training Academy at The Belfry, England. His national team work has continued as well with the Irish Ladies Golf team, being a key part of the development of many of the greatest female players to come out of Ireland in the past two decades - notably former world number one amateur, Leona Maguire, and current world top-30 amateur, Olivia Mehaffey – helping players earn titles such as Ireland’s first Girls Home International win in 2016, the Ladies Home International 2017 title, and numerous successful individual performances. Most recently Kearney left the role of Golf Director at Carton House Golf Club in County Kildare, Ireland, having helped to deliver a highly successful World Amateur Team Championship Espirito Santo and Eisenhower Trophies with the International Golf Federation, all whilst continuing his role as Performance Director for Irish ladies golf. “I often tell Professionals straight away to follow their interest and follow their heart. Ultimately what gets you out of bed in the morning and what makes you make an impact with somebody is the interest you have. Aaron Kearney turns pro: "It's now or never"
Dunne hails "thorough" Harrington: "If that team doesn’t win, it won’t be his fault"